Clothing Items, shirts and jackets, are priced with embroidery. Headwear are priced including Embroidery on the centre front of cap. No setup costs for Embroidery, minimum 50. 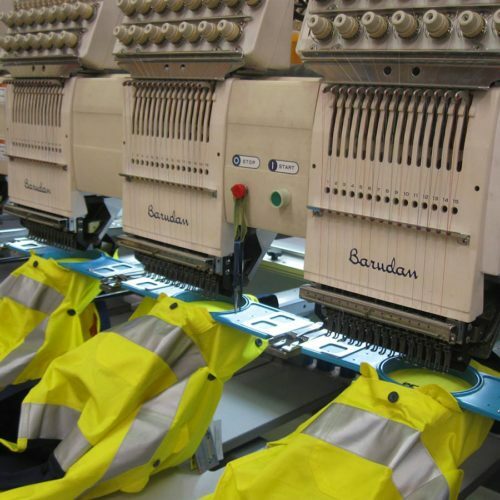 Embroidery is the preferred option for excellence. Rear and or side embroidery can be done at an additional cost. Headwear art can be in simple form jpg, pdf, as long as it clear. After receipt of your suitable artwork and confirmed order, we will prepare the decoration files and complete one sample cap for approval. Best effort will be made to duplicate the design, PMS or tones of your art. This will be photographed. Customer can either approve from the photo, or we will send the sample to you at no extra cost. In the case of Indent from China, if you do not approve the factory photo we will DHL sample to arrive within a few days. *Supplier will expect payment in full once sample is approved. Artwork positioning, and size required is to be emailed at time of order. If larger than standard 100 x 100mm, or a second or third logo is required, we will advise extra cost and add to invoice. PMS spot colours to be noted, as embroidery is completed by sewing machine and sewing thread, customers must accept that sometimes exact interpretation of shades and colours cannot occur. Supplier will arrange setup and completion of a stitched swatch of decoration required. Tee shirts can be screen printed by us or sent to you or your printer. Position, colours and sizes of prints to be noted, along with PMS of spot colours. Once detail has been received we will advise our competitive cost. Art will need to be in same format as garment print. We will readily advise print size if not noted on the SPECIALS site.